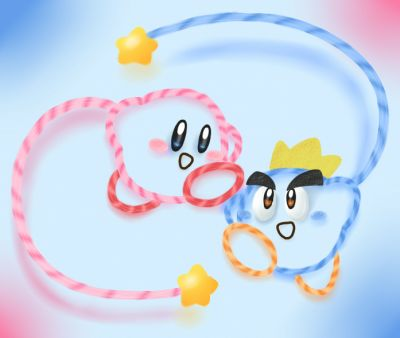 KIRBY'S EPIC YARN IS AWESOMEAWESOMEAWESOME!!! ;WWWWW; fjdasklhfasjdkl In celebration, I made a picture of Kirby and Prince Fluff!! The process can be seen <a href="http://www.youtube.com/watch?v=Cmu6LCa9h5M">here</a>. C; Now go and enjoy this amazing game!! Beautiful. I'm very impressed by the game so far. Such a lovely contribution. I like the harmonic composition of this piece with Kirby and Prince Fluff balancing out the space! That was neat to see your drawing process. You have the game yet?